2015 March - Member of the Month is GeorgeDp. Let's read a little about him and get to know him better. NOTE: George was extremely kind and re-donated the 1,000,000 EC back to the Fleet Bank for other members! Thank you! 1. How long have you been playing Star Trek Online? I started playing Star Trek Online in February but I would have started it much earlier if I knew about it! 2. Why did you originally start playing Star Trek Online? 3. Do you play any other games besides Star Trek Online? 4. Any other hobbies outside of Star Trek Online you’d like to share with us? 5. When did you join Liberty Task Force and what attracted you to us? What keeps you here now? You can do anything...talk about game, talk about real life, talk just...nonsense and fool around..., play with team, play alone, ask for advice...anything! Only bad thing is that there isn't much time to contribute to projects cause everyone is so open-handed that everything fills up in no time! 6. 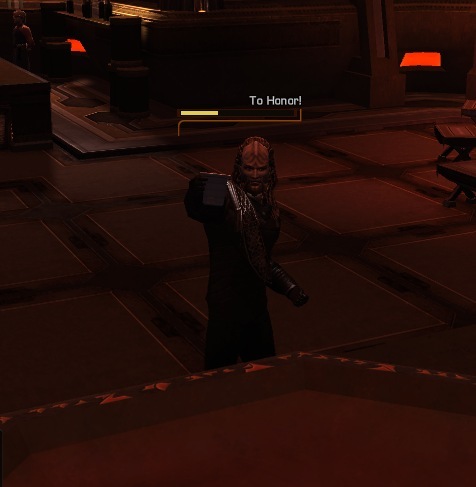 How many characters do you have on Star Trek Online? 8. How many ships do you currently have? 10. What activities do you like best or what is your favorite thing to do on Star Trek Online and why? 11. What is your long-term goal for Star Trek Online? Not so long-term will probably be the new toon for Delta Recruitment event, probably a KDF aligned Romulan... (yes...I ll make a Romulan! 12. What is your favorite Star Trek series or movie? Hmm, difficult to choose, i would say, TNG cause I grow up with it, but I also liked DS9 and Voyager. Enterprize wasn't that bad either but not as good as the others. 13. Who is your favorite Star Trek character and why? 14. On a scale of 1-10 how high on the Star Trek Geekdom Meter are you? 15. Anything else you’d like to add or tell us about yourself? Myself....dont know... first of that I'm not a min/maxer, I try to be above the middle but wont make it a purpose of my...life to be the best, just want to have fun and relax. I like having a general idea of many things but focus more in the ones I like. If you need a guy that knows a bit about (almost) everything (or knows where to look anyway) and can do many different things sufficiently enough to get you out of trouble or help you when needed then i'm your guy!